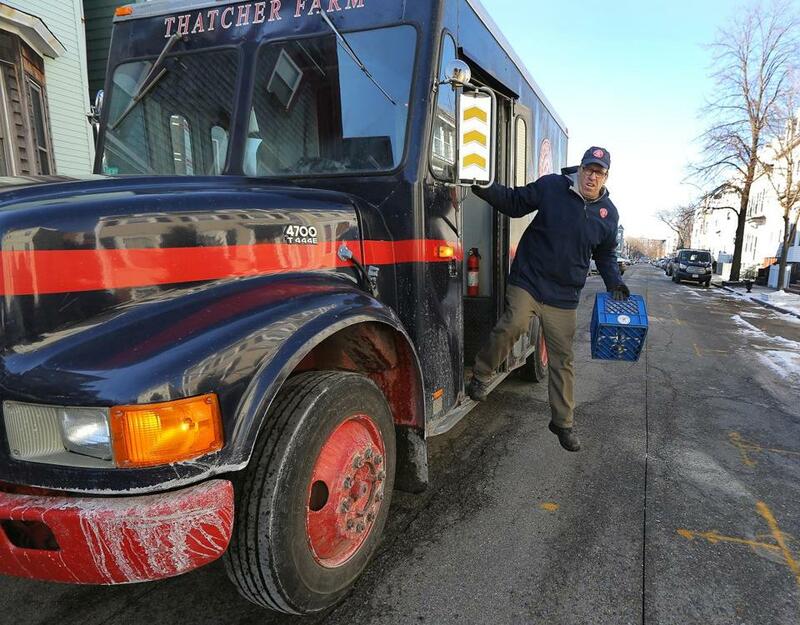 Roger Barsamian delivered milk from Thatcher Farm in South Boston. Every Wednesday morning, Brian Fruzzetti of Crescent Ridge Dairy in Sharon drives up to Jessica Gilmartin’s home in Newton. He enters and places butter, eggs, and a bottle of milk into her refrigerator. The delivery comes with another personal touch, Gilmartin says: Fruzzetti carries a dog biscuit in his pocket, which he gives to the family labradoodle. Fruzzetti and Gilmartin often pause to chat about their families. Then, Fruzzetti hits the road to bring dairy products to many of the approximately 4,000 customers in towns from Middleborough to Harvard that Crescent Ridge’s eight home delivery trucks service each week. 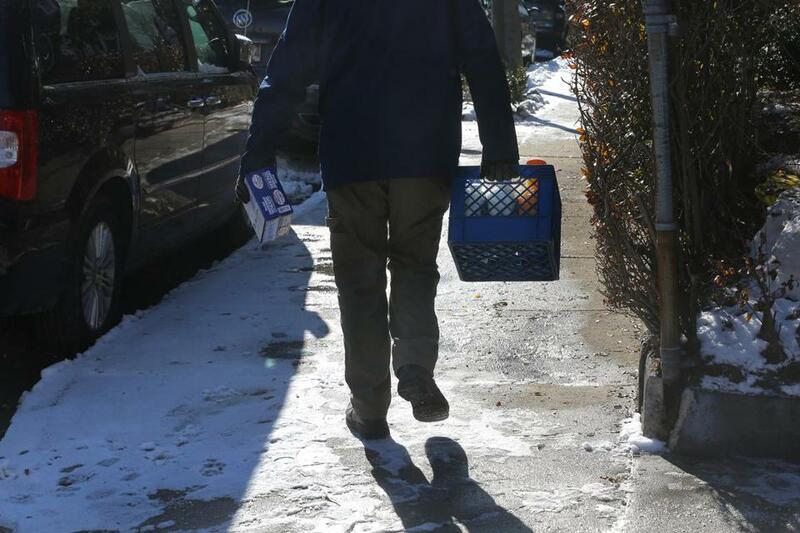 The milkman, that symbol of simpler times, appears to be making a bit of a comeback in Massachusetts. About 10 New England dairies deliver in the state, servicing everyone from families with children to single young professionals. While there are no concrete data on the popularity of home delivery, many dairies say they have experienced an increase in customers in recent years. The draw? Many people are seeking more personal connections with their food sources, as reflected by the popularity of farm-to-table dining. Others, who are helping fuel a broader grocery-delivery craze, simply love the convenience of not having to lug heavy jugs of milk home from the store. Nostalgia seems to be playing a role as well. At prices that hover in a range of $2.80 to $3.40 per half gallon of milk with varying fat content, home delivery is not significantly more expensive than buying a carton at the grocery store, especially when compared to organic brands. Warren Shaw, an owner of Shaw Farm in Dracut, said his home-delivery service, which dates to 1908, hit a lull about 15 years ago when the farm had about 300 home-delivery customers. Now, he estimates that the company delivers to between 800 and 1,000 homes each week. “I think in general, from Amazon Prime to the milkman, home delivery is in vogue and we’re catching as much of that curve as we can,” Shaw said. Crescent Ridge Dairy’s home delivery sales have increased 6 percent to 7 percent each year for at least the past three years, said Lisa King, the company’s business development manager. 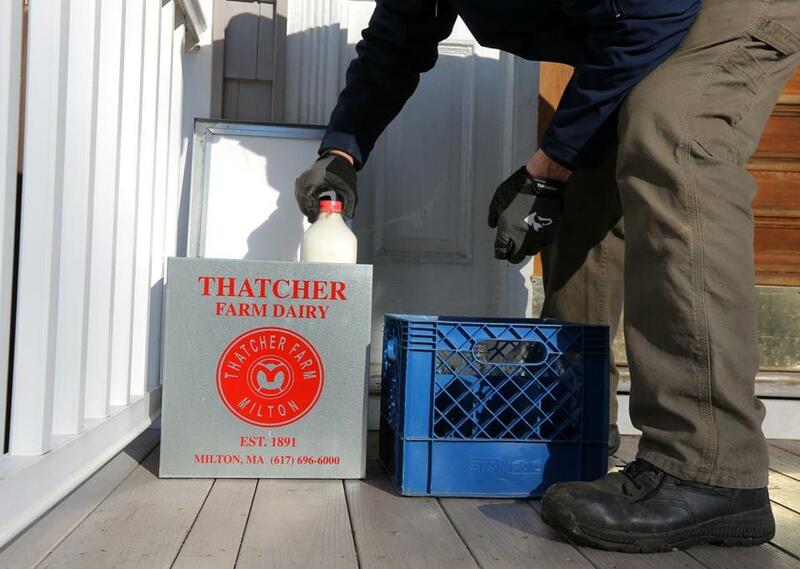 Tully Farms Dairy in Dunstable recently began offering home delivery for the first time in its nearly 150-year history, serving 14 households on its first day. Now, the farm will work on increasing its client base by reaching out to the 250 people who indicated they were interested when the family opened a farm store last spring, said Charlie Tully Jr., president of Tully Farms Inc.
“It kind of brings it back to the consumers,” he said. Convenience is a big selling point for Liz DiPesa, who runs a day care out of her Milton home. Between the products she receives from Thatcher Farm, also in Milton, and occasional deliveries from other sources, she says she rarely goes to the grocery store anymore. Many dairies now deliver a wide range of products other than milk, including eggs, yogurt, meat, pre-made meals, vegetables, ice cream, and even rock salt. DiPesa has become friendly with her delivery driver, Joe Manning, whose family has run the farm since 1891. “We talk about life, and we solve all the world’s problems in my kitchen. We wish the world would catch up with us,” DiPesa said. It’s that personal relationship that consumers seem to want, said Kiley Putnam, a spokeswoman for the New England Dairy & Food Council. “In general, the population has become further separated from the farm, and it’s clear to see the trend of consumers wanting to know where their food is coming from,” Putnam said. Still, aspects of the business have evolved. Thatcher Farm, in Milton, is now surrounded by houses, so there is no longer a dairy farm on site, said Pam Ames, the office manager there. The business gets its milk, already bottled, from Hatchland Farm in Haverhill, N.H.
Crescent Ridge has shifted its focus from dairy farming to raising beef. For home delivery, the farm gets raw milk from the St. Albans Cooperative Creamery in Vermont and pasteurizes the milk at its Sharon location. In the end, the old-time feeling may be the biggest draw for customers. “They love the nostalgia of the milk truck rumbling down the street and the glass bottle clinking at the front door,” Ames said. Roger Barsamian stepped out of his truck during a delivery.